Price: this publication is available for free download from the ukadia website: www.ukadia.ac.uk. Please contact Kirsty Morris, k.r.morris@arts.ac.uk, if you would like a printed copy. Inclusive Practices, Inclusive Pedagogies is a collection of excerpts from research carried out by 23 authors into issues relating to the impact of widening participation. 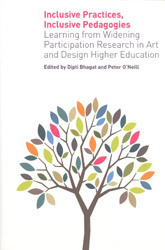 The research applies specifically to Higher Education art and design and is arranged in four parts: ‘Widening Participation: Towards Inclusive Practice’; ‘Accessing Higher Education’; ‘Succeeding in Higher Education’; and ‘Beyond the B.A.’. Each part is prefaced by a succinct introduction by the editors, Dipti Bhagat and Peter O’Neill, of London Metropolitan University. The book is ‘structured around a learning life-cycle’ and prompts consideration of issues relating to both pre and post entry to, and graduation from, Art and Design Higher Education. ‘Reverie is at the heart of learning,’ says Jane Graves in a chapter about academic writing and dyslexia (p.212). This book is valuable on many levels, but perhaps its greatest value is as a catalyst for deep reflection on personal practice and pedagogy. The sections carry the reader through explorations of the meaning and implications of widening participation; access, transition and integration into higher education; the positive impact of individual learning spaces; assessment; academic writing and attitudes to learning differences; Foundation Degrees and work-based learning; and rounds off with careers, post-graduate study and employability. The book was commissioned in 2008 and acknowledges that ‘widening participation is today much more encompassing as attention is paid to all aspects of the student lifecycle’ (p.44). Indeed, as a tutor in an HE Art and Design school within a Further Education college, much of the research in the book reflects debates in which tutors are engaged and which form the basis of professional development priorities. Perhaps the ‘widening participation’ or ‘non-traditional’ labelling is a diversion if David Watson’s concern, quoted in the introduction to Part 2 (p.51) is acknowledged: ‘Is HE simply a sorting device or does it have transformative possibilities?’ If we aspire to the latter, which should surely be the case, then reflection on concerns and considerations raised in this book should apply to the teaching of all HE Art and Design students. Malik-Okon captures the heart of the issue in his research in another context, the participation of black and minority ethnic students in HE Art and Design: ‘[w]idening participation initiatives aimed at increasing numbers or addressing diversity through representation and inclusion, will not be as effective as those which aim to transform structures and processes and enhance individual experiences’ (p.38). ‘Dedicated...personal studio spaces once par for the course for Art and Design students, and technical facilities essential to processes of making objects of art and design now come into conflict with reduced external funding and consequent institutional fiscal policies. Students with limited economic capital and/or those juggling various external commitments (family, job, health) may find what studio space there is inaccessible: on the one hand this draws institutional attention to the cost of under-utilised space; on the other hand, the inaccessibility of dedicated learning spaces in institutions should alert all concerned with inclusive and equitable student learning to the reality that many students increasingly make work at home, often without access to suitable space’ (p.139). In our efforts to provide a curriculum that develops deep thinking, confidence, the ability to articulate and achieve success, the debate about the role of academic writing is lively and on-going. There are several points of view: art theory is a subject in its own right; contextual studies should be situated within the studio; we need alternative forms of assessment if we are to offer equality of assessment opportunity. ‘Our challenge is to enable our students to participate productively in an exchange about their subjects, appropriating, challenging, or resisting as they go,’ say Bhagat and O’Neill (p.227). Two opposing points of view regarding the importance of academic rigour in design research are presented by John Wood and Keith Russell. Jane Graves, in a chapter which begins with a discussion of Writing PAD and then continues with personal reflections on her work with dyslexia, asks the question: ‘Are we providing an education in art and design, or are we training artists and designers?’ (p.210). She describes Julia Lockheart’s approach of explaining ‘traditional academic structures in a visual way...converting words into visual structures and getting students to create their own categorisations for structures, rather than getting them to work within the taxonomies and classifications of others, seems to encourage a better understanding of how writing communicates ideas’ (p.220). Rather than expanding the existing cultural ‘canon’, with its implications of Bordieu’s cultural capital and its potential for alienating those students who do not inhabit that cultural capital, Bhagat and O’Neill propose an approach which Fernando Ortiz calls ‘transculturation’, that is, the meeting of two cultures: ‘for our purposes, when the two cultures of HE and student meet and interact’ (p.226). More material here to add to the debate! The final part of the book considers life after graduation. ‘With levels of student debt rising, it is simply no longer acceptable for institutions to ignore the issue of employment.’ I couldn’t agree more. Student employability, preparation for self-employment, entrepreneurship and work with creative industry contacts are embedded in the curriculum at Hull School of Art and Design in both BA (Hons) and Foundation Degrees. Art and Design students are natural creative thinkers and problem solvers; at a time when the importance of the arts in the school curriculum is threatened by government policy and yet expectations are that small businesses will provide increased employment opportunities, the value of art and design training in the wider context of the economy needs to be properly understood. I will return to this book frequently. It should be required reading for all HE and FE Art and Design tutors, art teachers in secondary schools and sixth form colleges, who are crucial partners in supporting students to achieve success in the ‘learning life-cycle’. The bibliographies at the end of each chapter are invaluable sources of further reading and the issues raised provide a template for professional development planning for HE Art and Design institutions. Jackie Goodman is Quality, Improvement and Student Support Manager at Hull School of Art and Design, Hull College. Hyde, M. (2012) ‘Alas, it seems, Ed Miliband is well on his way to brollydom’, The Guardian, Friday 12 January 2012.